We’d only been dating a few weeks when I arrived at his parents house (yes he still lived with his parents but to be fair so did I and we were both very young) to find him ‘washing’ his original Star Wars figures in the bathroom sink. He was a little embarrassed to be caught doing this and tried hard not to let me see how concerned he was. His bedroom was in the attic and he’d come home from work that day to discover it was over 40 degrees. 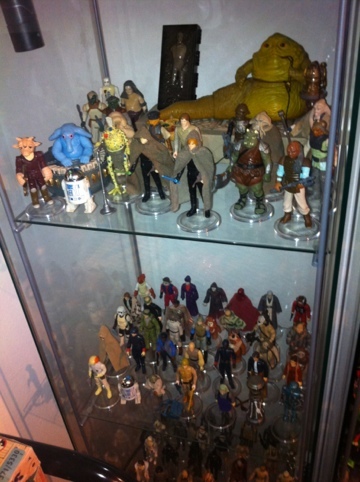 His most precious Star Wars figures all lived in a glass cabinet and the plastic was sweating in the heat! He was busy bathing them to get them cool again. Unfortunately there were a few casualties who just couldn’t be saved. A melty Max Rebo whose arms had changed colour too sticks in my mind the most. As any scifi wife will know it goes without saying that we have since found replacements. The Star Wars figures now. Back in a glass cabinet but this time in a carefully temperature controlled room! Long suffering wife of a scifi nerd. Follow my blog as I rant, moan, complain and, quite frankly, laugh at the antics he gets up to. Are we the only people in this country who want to see Star Wars VII?